Set of automated workflows for Adobe InDesign, QuarkXPress, and more. Is there a better alternative to Ultimate Productivity Automator Action Pack? Is Ultimate Productivity Automator Action Pack really the best app in AppleScript category? Will Ultimate Productivity Automator Action Pack work good on macOS 10.13.4? Ultimate Productivity Automator Action Pack This Automator Action Pack contains A COMPLETE SET of Automated Workflows, LLC's Automator actions for Leopard, for use with a variety of applications, including FileMaker Pro, Illustrator, InDesign, Photoshop, QuarkXPress, and more! Automated Workflows, LLC's Build Real Estate Catalog Example Workflow, built with actions from the Ultimate Productivity Automator Action Pack, was the recipient of the 2006 Apple Design Award for Best Mac OS X Automator Workflow. With the Ultimate Productivity Automator Action Pack, you can build winning workflows of your own! Now includes a total of 170 actions! Mac OS X 01.5 or later, Adobe InDesign, Adobe Photoshop, FileMaker Pro, QuarkXPress, or iPhoto, etc., depending on the actions used. Ultimate Productivity Automator Action Pack needs a review. Be the first to review this app and get the discussion started! 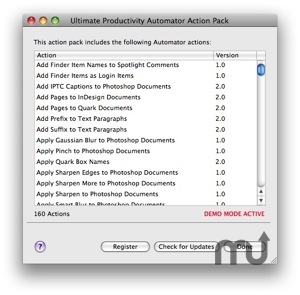 Ultimate Productivity Automator Action Pack needs a rating. Be the first to rate this app and get the discussion started!